This book explores the three-way struggle between the British colonists who settled North America, Australia, New Zealand, and South Africa; the British government and its U.S. and Canadian federal government successors; and the indigenous peoples of the settled regions. In the colonies, British law and popular norms clashed over a range of issues, including ready access to land, the property rights of aboriginal people, the taking of property for public purposes, and master-servant relationships. This book will greatly appeal to law professors, historians, and anyone interested in the rights of native peoples. List of illustrations; List of tables; Introduction; Part I. Land: 1. Law versus customs; 2. Concribs, manuring, timber and sheep: landlords, tenants and reversioners; 3. 'They seem to argue that custom has made a higher law': squatters and proprietors; 4. Protecting one's prope'ty: takings, easements, nuisances and trespasses; Part II. Agreements: 5. We have an agreement; 6. Work: the formal and informal law of labour contracts; Part III. Accidents: 7. 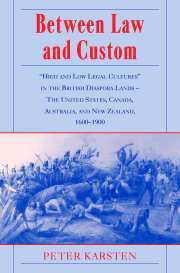 Judicial responses to negligence claims by the British diaspora, 1800–1910; 8. Beneath the iceberg's tip; 9. Further sorties into the high, middle and low legal cultures of the British diaspora with some conclusions; Cases discussed; Cast of characters; General index.